Sinfonia Toronto is a per-service chamber orchestra operating under a master agreement with the Toronto Musicians' Association. The 2019-20 contract will offer a guaranteed minimum of 37 services. The position of section violin will pay $171.00 per-concert and $133.95 per 3-hour rehearsal plus 7.5% pension contribution. The orchestra is invited for a three-week tour of China (September 9-30, 2019). The successful candidate needs to have valid travel documents. Sinfonia Toronto presents its Masterpiece Series in Glenn Gould Studio and Toronto Centre for the Arts, performs regularly in other Ontario centres, and presents education/outreach performances in the Greater Toronto Area. It has toured twice in Europe, performed in Florida in 2015, and toured in South America in April 2018 for two weeks in Peru, Argentina and Uruguay. 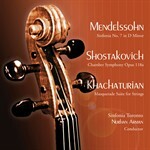 The orchestra has recorded four CD recordings, including a JUNO Award winner. Its repertoire includes most of the standard chamber orchestra music as well as many contemporary works; it has given numerous premiere performances. Auditions are by invitation. They will be held on Wednesday, June 12, starting 12:30 pm at the Willowdale Emmanuel United Church, 349 Kenneth Avenue, Toronto. No sight-reading will be required. Applicants must play their concerto choices without piano accompaniment. We thank all applicants for their interest; only short-listed candidates will be contacted; no phone calls please.